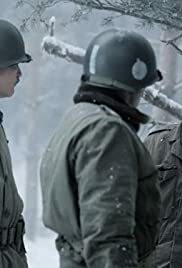 It's Christmas 1944, and the 101st is surrounded by Germans in the forest outside of Bastogne with a lack of supplies in bitter cold and snow. Ben Caplan ... Walter S. (Smokey) Gordon Jr.
Pvt. Edward 'Babe' Heffron: Hey Gene? Pvt. Edward 'Babe' Heffron: You called me Babe. Cpl. Eugene Roe: I did? Pvt. Edward 'Babe' Heffron: Just now. Cpl. Eugene Roe: [Trying the name out] Babe... Guess I did. Cpl. Eugene Roe: Heffron? Watch the goddamned line. The horrific tone that was teased in the previous episode, in here is full of it that easily chills down the spine when encountering and addition to that there is also a decent mellow conversation which was unexpected in this series.